Really Reasonable Ribbon Blog: Really Reasonable Ribbon ROCKS!! Hello, my ribbon-loving friends! Karen Letchworth sharing today. It's no secret that I love making cards, and I LOVE my bows. Really Reasonable Ribbon has ALL the best ribbons and trims to make my bows look fabulous. Just look at this GORGEOUS new 5/8" Satin with Stitched Center Ribbon in Robin's Egg Blue. It's absolutely lovely, and it comes in seven beautiful colors. I won't be satisfied until I own them ALL.....because, YES! They're THAT gorgeous. I started my card with some Crate Paper patterned papers that I machine stitched together. I added a small chipboard frame that I backed with a piece of vellum and added several sequins that I placed inside it. My sentiment is stamped with Tim Holtz Black Soot Distress Ink, and I also added a sequin to that. I ran a length of this luscious new 5/8" Satin with Stitched Center Ribbon in Robin's Egg Blue across the card, and also made two bows with it that I layered (one on top of the other). Isn't it FABULOUS? I couldn't resist sharing a close-up photo so you can really see how lovely it is! I also added small bows made from Gold Metallic String, Solid Wheat Baker's Twine, and Mint Solid Baker's Twine. I topped that sweet bow with a light blue button using my hot glue gun. Just look at how that Gold Metallic String SPARKLES!! Really Reasonable Ribbon ROCKS, and they have EVERYTHING you need to make a spectacular card, scrapbook page, head band or bow, and SO many other possibilities. I encourage you to check out this gorgeous new ribbon, among all the other fabulous products they carry. 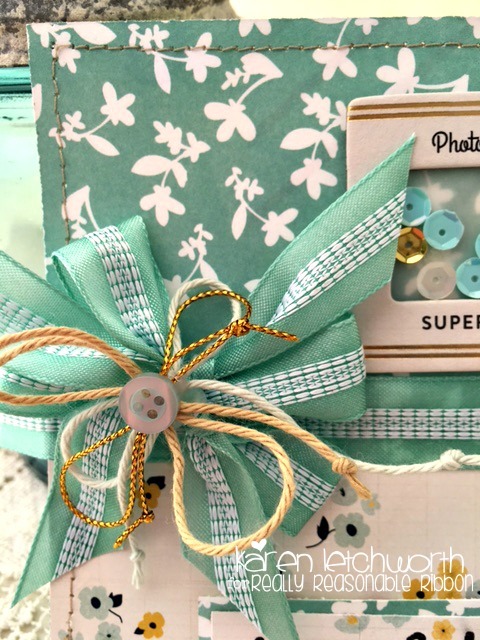 And don't forget the FUN CHALLENGE taking place on the Really Reasonable Ribbon Blog. Karen, this is pure sweetness! love the shades of aqua everywhere! :) and so far I'm in the hoarding stage with all of my colors of this new ribbon..... tee hee! but you sure are challenging me to actually use some of it! Just a beauty and the details all went together in a gorgeous card. I just bought the aqua ribbon in the pink shade and can't wait to find a way to use it. I feel the same way of the hoarding stage the other day when I was organizing my RRR ribbons. 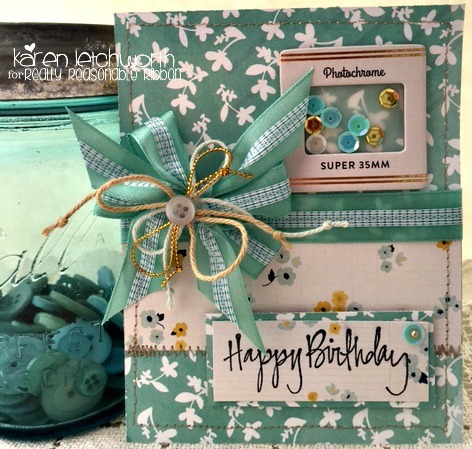 I love the aqua color and you really did a gorgeous cards with the beautiful matching paper. Hugs!!! So pretty! I like everything about it. The birthday person who gets this card will be so happy. Love this card and all the trimmings! Can't get it off my mind...the colors are so soothing and springlike! Great design and the ribbons are just so pretty. 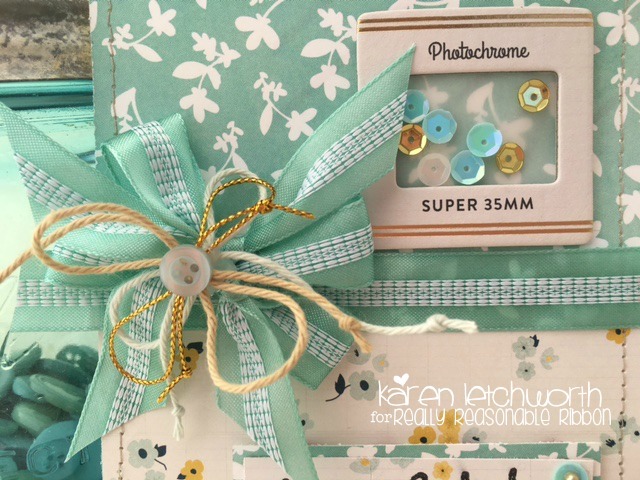 Where can I get the patterned paper?